This bowl features shades of elegant black, luscious purples, and rich gold topaz made from hand pulled canes. Working with canes is a time consuming two-stage process. First Dirwood had to hand pull the canes used to make this bowl, then he made this bowl using those canes. When making the canes, Dirwood also added real gold adventurine for a gold sparkle, the more light you shine on this bowl... the more it sparkles! 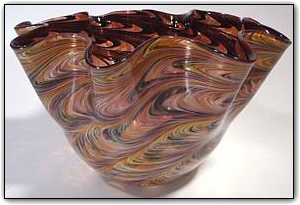 Make sure to zoom in to see just how amazing the colors and patterns are, this is one awesome fluted bowl.